Imagine Jaws but has been given a little ‘rough round the edges’ 2018 CGI re-jig. That’s ‘The Meg!’ And it was brilliant. I’m obsessed with sharks and have been since my dad moved to Florida 15 years ago. He lives on the Gulf of Mexico infested with Bull and Tiger sharks and I’m fascinated with the sightings and attacks that happen. Naturally anything on telly or at the cinema involving sharks I’m there. 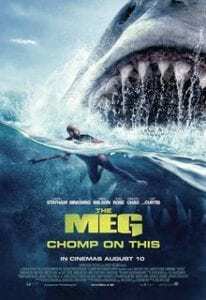 Now because in the trailer to ‘The Meg’ it looked like a shark ate a dog, it wiped out half of my mates who I thought would come along and see it with me. There was one gal pal who was bang up for it and we were so excited we decided as soon as she had a spare day free we would go after the breakfast show! Wednesday at 11:30am and the Odeon was quite full up to be fair. A huge screen to see this magnificent monster shark in all its glory. And to see Jason Statham face up on a big screen was lovely as well. We jumped and collectively screeched along with the whole of the Odeon in that screen. I don’t care what the Hollywood critics say but I thoroughly enjoyed it. The perfect film for a cinematic experience, action, explosions, suspense, thrill and cheeky love story throughout! 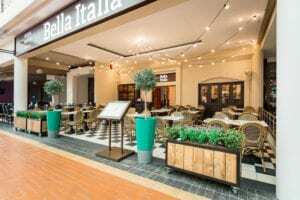 After that exhilarating deep sea experience we headed to the brand new refurbished Bella Italia in the RDC. It’s setting is now more open plan, it’s fresh, airy and friendly and with a gorgeous vintage Italian decor. The worst part (and this always happens to me) is eating far too much for starters so I can’t fully enjoy my spag bol. If I could recommend anything to eat inside the RDC you have to order the Mozzarella Carrozza. It’s like a big fat square mozzarella stick. It’s crispy and deep fried served with an amazing dolce piccante sweet chilli sauce. The cheese is hot and so tasty. All in all my mid-week gal pal day out was perfect. From my favourite type of film to the most amazing mozzarella slice I’ve tried in my life! I’m still drooling thinking about them.